India is a very diverse country and everytime a lot of miraculous things happen in this country. The country is rich in traditions and values and people respect their culture a lot. There are lots of visit places to see in india. People of India revere their great leaders who led their way to the ultimate thing called independence. A lot of people fought for the independence of India and one of the most important people in this independence struggle was Sardar Vallabhbhai Patel. The government of India has built a 182 metres statue in the remembrance of the great statesman of India. The most notable thing here is that this statue us the tallest statue in the whole world. This is a great dedication to such a great man. So let us talk about the different things related to this statue. There are a lot of things to discuss. The statue of unity is a wonderful place to visit and there are an obviously lot of tourist attractions here. The first and most important thing is that it is 182 metres tall and everyone would like to see a statue of such great height. The gallery of the statue is a great attraction as well. 200 tourists can walk into the head of the statue. Also from the gallery of the statue, the tourists can get a great view of the Sardar Sarovar dam and the surrounding regions around the statue. All this one can view from a height of 400 feet. Another tourist attraction is the Sardar Patel museum which is created at the base of the statue of unity. The museum is having around 40000 documents related to the life of Sardar Patel. Also, there are 2000 photographs on the life of Sardar Patel. There will be a star hotel adjacent to the statue of unity. The hotel will have 128 rooms. These are the tourist attractions of the statue and person should must visit this statue. Such is a great statue is dedicated to Sardar Patel. So there is a need to know some things about Sardar Patel. Sardar Patel is also known as the Iron Man of India. He was a senior leader of the Indian National Congress party and also was the statesman. Sardar Patel was the first deputy Prime Minister of India country. The birthday on Sardar Patel is on 31st October and is celebrated as Rashtriya Ekta was in India. He played a key role in the independence of India and was founding the father of the Republic of India. The statue of unity is the tallest statue in the whole world. The height of the statue is 182 metres which are equal to 597 feet. 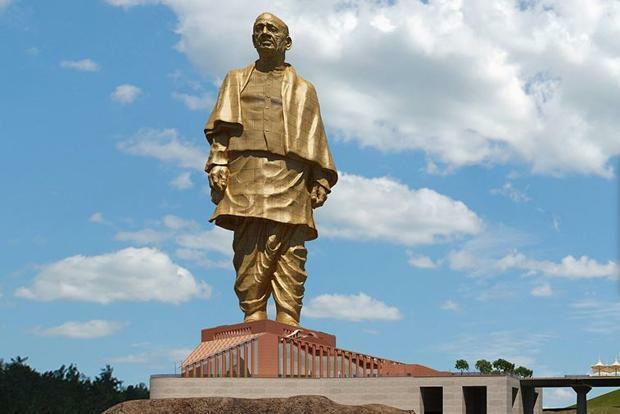 The statue is built in the kevadiya village in the Narmada region of Gujarat state. The statue of unity took 46 months to get completed. It was a great and long project. The statue was unveiled on 31st October 2018 by the honourable Prime Minister of India, Narendra Modi. The statue of liberty is going to have a viewing gallery at the height of 153 metres. This gallery will accommodate around 200 people at one time. This gallery will offer a great view of the Sardar Sarovar dam. Around 3000 crores of rupees were spent to build this great statue of unity. The total weight of the statue is around 1700 tonnes. The statue of unity is designed by Ram V. Sutar, the winner of the Padma Bhushan award as well. The height of feet of the statue of liberty is 80 feet. The height of the hands of the statue is around 70 feet. The height of the shoulder of the statue is around 140 feet. The height of the face of the statue is around 70 feet. The gallery of the statue of unity is made in the heart of Sardar Patel. From here the tourists can get a great view of Sardar Sarovar dam and Satpura hills as well. Near about 25000 tonnes of iron and 90000 tonnes of cement is used in the construction of this great statue of unity. The statue of unity can withhold a wind speed of 220 km per hour and also it can withstand the earthquakes measuring up to 6.5 on the Richter scale. A highway of around 3.5 km is built to connect this statue in sadhu island to kevadiya town. The iron needed for building the statue is brought from different villages all around India. 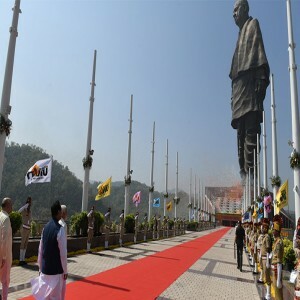 The statue of unity is inaugurated on the 143rd Jayanti of Sardar Patel. These are some of the most important facts related to the great statue of unity. There are other statues all around the world and some of the most important are as follows. the opening timing of this statue complex for the public is 9 am to 6 pm for every day in a week.